Guest columnist Wendy Nan Rees talks about some common summertime dangers dogs face, including sunburns, dehydration, and heat exhaustion. Find out how to protect your pet and which first aid steps to follow if your efforts fail. Summer is here and I wanted to remind you of the importance of your pets' needs during hot weather. This week I will comment on dog summertime dangers and touch on symptoms of heat exhaustion as well as treatments for affected dogs and preventative measures you should take. Overheating can become very serious during very hot weather. It is not only uncomfortable for your dog, it can lead to serious health problems. Prevention: During hot weather, make sure your pet is in an area that is well-ventilated with good air flow. Supply plenty of fresh water. You can use a fan aimed on the dog's crate to create better airflow. Never take a dog out in a car on a hot day if you don't have to. Also, if your pet is outside, make sure they have adequate shade to keep out of the sun. Symptoms: Swollen tongue, cloudy eyes, excessive panting and white or gray gums are all signs of heat exhaustion. 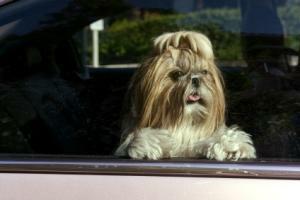 A dog left in a car for only five minutes can suffer heat stroke. If left untreated, the dog will die. Treatment: If your dog is showing signs of over-heating, take the pet into a shaded area and ventilate with a fan. Run cool water over the pet, not cold water. Use a cool tub or hose to cool him down. Also run cool water over his ears since this will also help cool him down. Pay close attention to the abdomen and the area where the legs connect to the body. This will help cool the dog faster. While you are trying to cool him down, please do not offer drinking water in large amounts because this can make him vomit. Offer small amounts of water, or offer ice chips until he has cooled down enough, and then he can drink safely. Dehydration can happen as a result of overheating. Be sure your dog has access to plenty of water whether you are out playing with him or if he is alone outside while you are away. Prevention: Be sure to hydrate your dog before exercise! Never go out between 11:00 a.m. and 3:00 p.m., and stay out of the heat and sun at the height of the day. I would limit running with your dog during the heat of the day. I would also limit hiking and throwing a ball or other toys. Symptoms: Dehydrated dogs display a dry nose and mouth, eyes that are sunken and dry, and loose, flabby skin that doesn't snap back into place when gently tugged. Treatment: Get the dog re-hydrated as soon as possible. Water can be used, but must be offered in small amounts at short intervals. If a severely dehydrated dog is offered too much water, he will begin to vomit, and this can cause further dehydration. Electrolyte solutions can be used for dehydration. If you suspect severe dehydration, rush the pet to the vet. Dogs can get sunburn even though they have fur. Lighter haired pets can suffer sunburn more than darker pets. Prevention: Pet breeds that are susceptible to cancer should be protected from sun even more since they could develop cancer from prolonged exposure. Sun block is recommended as a preventative, or you can use a body suit that uses fabric that blocks UV rays. You can also avoid the hours between 11:00 a.m. and 3:00 p.m. to help prevent your pets from becoming sunburned. Symptoms: Signs of sunburn include redness and hair loss from ear tips, abdomen and the bridge of the nose. While most pet sunburns may be minor and heal with time, repeated exposure can lead to cancer in pets, just like people. Treatment: Spray the area with cool water at 30-minute intervals, or use a cold compress held over the burn. Witch hazel applied every few hours will take away the heat of the burn, and skin conditioners can be used as well. You can also give your pet a bath in lukewarm water with colloidal oatmeal mixed in the water. Aloe gel can also be added; this will cool the sunburn and help it heal faster. Never leave your dog in an unattended car, not even for five minutes in the shade. The car can get 30-50° hotter inside within five minutes and cause heat stroke. It is against the law to leave a dog unattended in a hot car in nearly all communities. If you have a swimming pool and your dog loves to swim, that is fine. However, don't just throw the dog in the pool; let him enter it at his own pace. If you throw him in, he can ingest pool water with chlorine in it, and that can make him sick. If you are allowing your dog to go swimming, make sure that you bathe him after his dip, so you can get all the chlorine-laced water out of his hair coat and body. Be safe and have a fun summer!